Is The Latest Rise In Housing Permits A Sign of Things to Come? 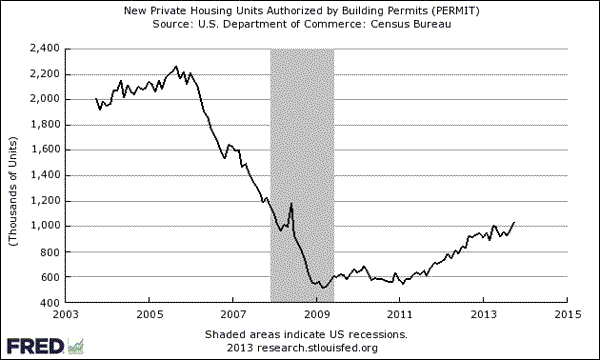 HomeBusinessIs The Latest Rise In Housing Permits A Sign of Things to Come? Yesterday’s surprisingly strong update on newly issued housing permits is a convincing signal for expecting that the residential real estate market will continue to grow in the near term. The double-shot releases of September and October data for permits beat expectations by a healthy margin. Last month’s number was especially strong, with permits rising to a 5-year high. The release of the hard data on housing starts, which usually accompanies the permit numbers, has been postponed until Dec. 16. But since permits and starts tend to track one another through time, yesterday’s upbeat news suggests that it’s likely that the triple play of September, October and November starts data that we’ll see next month will tell an encouraging tale. The news on permits is all the sweeter because it aligns with a positive macro trend overall for the US. As I discussed earlier this week, the current macro profile continues to imply that the moderate rate of expansion will endure for the foreseeable future. Although there’s always something to worry about, there are minimal signs of business cycle risk in terms of a broad review of the latest numbers. If you’re looking for something to worry about, the labor market is surely at the top of the list… still. The main threat to sustained growth for the economy overall is a tepid rate of increase in jobs. In fact, that’s what we’ve seen recently, although the higher-than-expected advance in last month’s report on private payrolls suggests that we may see better numbers in the months ahead. One piece of supporting evidence for thinking positively is the recent decline in initial jobless claims. An improvement in the labor market would be especially welcome when combined with the news that housing construction appears to be humming along nicely. With that in mind, today’s weekly update on initial jobless claims (released later this morning–a day earlier, because of tomorrow’s Thanksgiving holiday) is the next data point for deciding if there’s more to yesterday’s report on permits than simply filing paperwork.